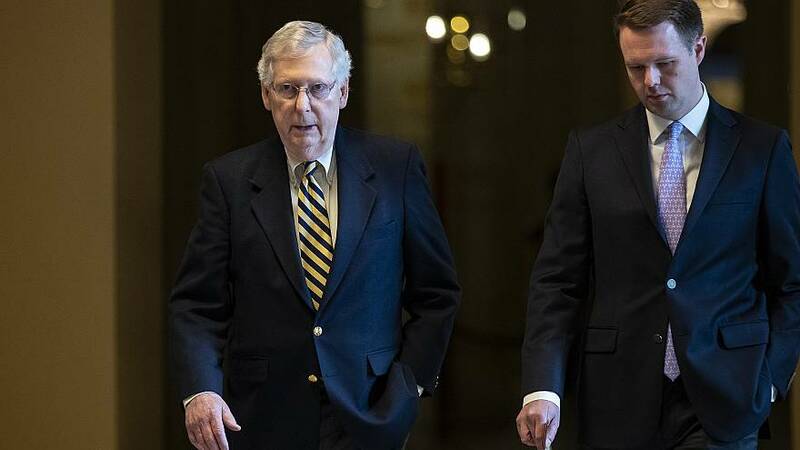 WASHINGTON — Senate Majority Leader Mitch McConnell on Monday blocked an effort by Senate Minority Leader Chuck Schumer to unanimously pass a non-binding measure expressing that Congress wants Robert Mueller's report outlining the results of his Russia investigation be made public. Schumer attempted to unanimously pass the measure — the same resolution that unanimously passed the House in a 420-0 vote earlier this month — without a roll call vote Monday evening. "Whether or not you're a supporter of President Trump or not, whatever you feel there is no good reason not to make the report public," Schumer said on the Senate floor Monday. "The American people deserve to see the documentation, what did they do? Who did they approach? What happened?" McConnell objected to Schumer's effort. "I look forward to the release of more information in the coming days as the attorney general says he intends to do in consultation with special counsel Mueller," McConnell on the Senate floor. "And I look forward as well to the continuing parallel work of our Senate colleagues on the Select Committee on Intelligence to study the threats that foreign interference pose to our institutions." Because the measure is non-binding, it wouldn't force Mueller or Attorney General William Barr to release the report. Schumer had previously attempted to pass the measure in mid-March, but Sen. Lindsey Graham, R-S.C., chairman of the Judiciary Committee, objected. The Democratic leader's effort came the day after Barr submitted a four-page summary of Mueller's report to Congress in which he said that Mueller, as special counsel of the Russia probe, did not find evidence to prove criminal collusion between the Trump campaign and Russia during the 2016 election. Barr also wrote that he and Deputy Attorney General Rod Rosenstein "have concluded that the evidence developed during the Special Counsel's investigation is not sufficient to establish that the President committed an obstruction-of-justice offense." Meanwhile, six committee chairs sent a letter to Barr Monday calling on him to submit the full Mueller report to Congress, along with the underlying documentation, by next Tuesday, April 2.